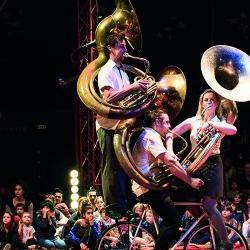 Under a star studded big top a vibrant band of international acrobats and musicians invite you to share in their circus spectacle, Now or Never. Join in the feast as acrobats and musicians mingle, make and share pancakes before launching into an exhilarating fanfare of music and circus. And then watch as they fly, fling and swing across their beautiful tent on trapeze, Cyr wheels, trick bicycles, trampolines and seesaws to the thundering sound of brass. Crazy, colourful and chaotic, Now or Never is an unmissable celebration in a big top in the grounds of Coleg Menai on Ffriddoedd Road in Bangor. An unforgettable experience and great for sharing with family and friends!